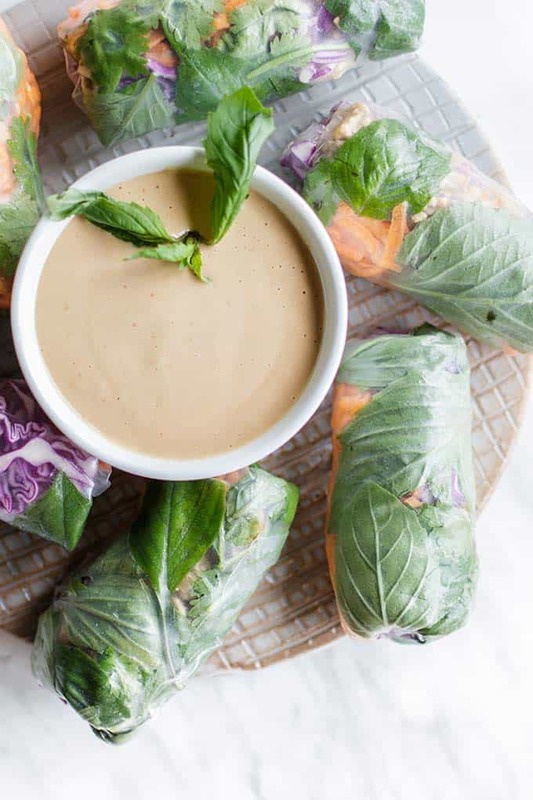 These healthy and light Thai Spring Rolls are served with a “peanut sauce” made allergy friendly with almond butter. 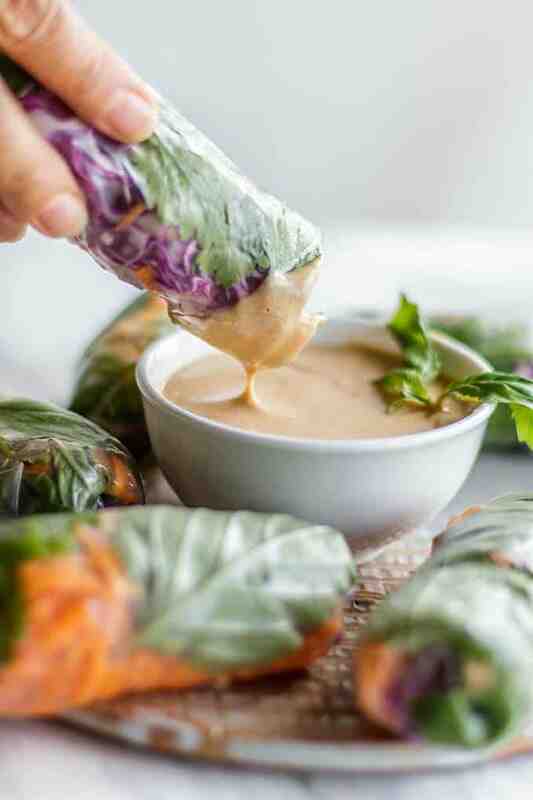 It’s easy to make fresh spring rolls once you learn the simple technique I share below! These can be made with a variety of fresh vegetables, but I keep it simple and flavorful by adding ginger stir fried chicken, carrots, cabbage, and herbs. Fresh spring rolls have my heart. The first time I tried them, I was hooked, because they are so crunchy and full of interesting flavors and textures. I am not a fan of deep fried spring rolls. I wanted to make some at home (because I have a peanut allergy, and eating Asian food outside my home isn’t very safe!). My first attempt was a pretty sloppy mess! I oversoaked the rice paper wrappers, and they clung to the cutting board and were very difficult to wrap. I have been making these for about 10 years now. We love having them for dinner, and I love having the leftovers in the fridge for healthy protein packed snacks. I have learned a few tips along the way! Don’t oversoak the rice paper wrappers. Use very warm water (I start with boiling water, and then allow it to cool a bit until it doesn’t scald me to put my hand in). Dip the paper in getting both sides wet, and only keep in the water for about 1-2 seconds. It will continue to soften as you add the fillings. Have all your ingredients ready to go and in a line, so once the wrapper is soaked, you can quickly fill it. If you allow the rice paper to fully soften on the cutting board, it will adhere to the cutting board and be very difficult to scrape off! Start with dry ingredients. I like to put my herbs down first in the center of the rice paper wrapper. This keeps the water from the other ingredients from soaking into the wrappers and making them soggy. 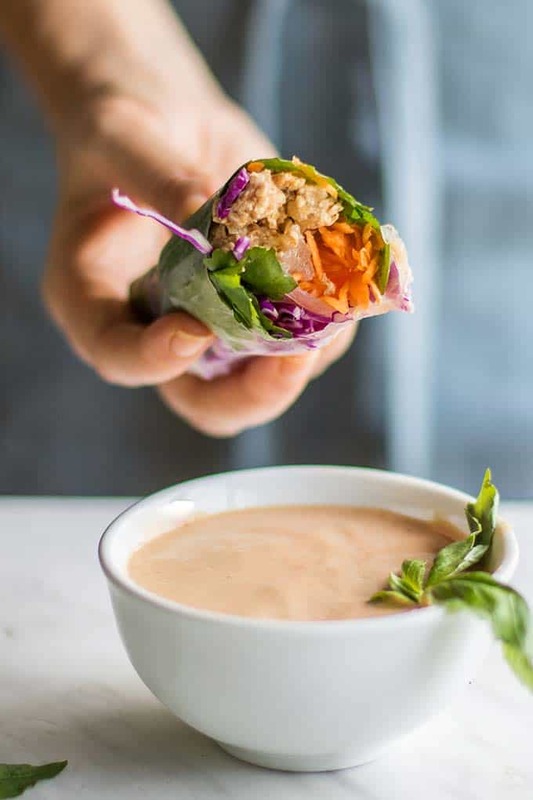 Make sure if you’re adding chicken or fruit like mango to your Thai spring rolls that you add it to the center, and that it’s fully surrounded by herbs or dry veggies, like the cabbage. Fill quickly, and then roll like a burrito. You can see this process in the video. Think of taking the top and bottom, and folding in to the center so they barely overlap. Then grab one side, and roll tightly towards the other side. Add them to a large platter or to plates individually, with space between each roll. If you allow them to touch, they will stick together. 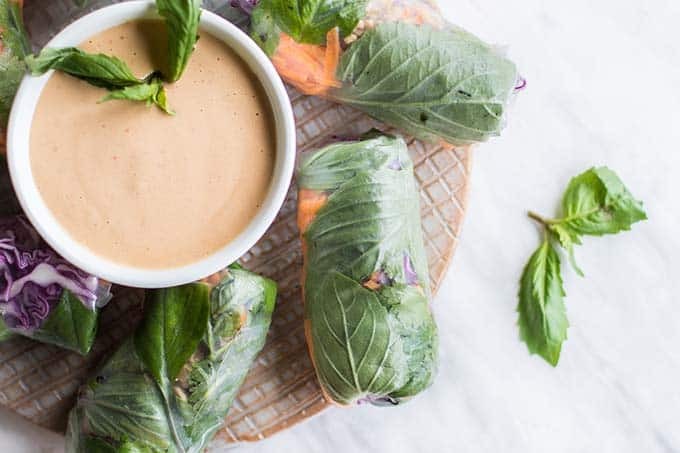 If you’re making extras to keep in the fridge for a meal later on, or to have as snacks, put parchment between the layers of spring rolls to keep them from sticking to each other. The first time I made these, I liked the idea of a peanut sauce to dip them in, but I am allergic to peanuts. I found a recipe online for peanut sauce made with coconut milk, and adapted it using almond butter instead of peanut butter. Holy smokes. Mind blown. My favorite dip / salad dressing / sauce to lick off a spoon ever since. Save this recipe, if for nothing else than for the amazing Thai inspired dipping sauce! I have since remade the dipping sauce to also be soy free – which makes it paleo and Whole30 friendly. The sauce is super toasty and creamy from a base of almond butter and coconut milk, which “fluffs up” when you blend it. 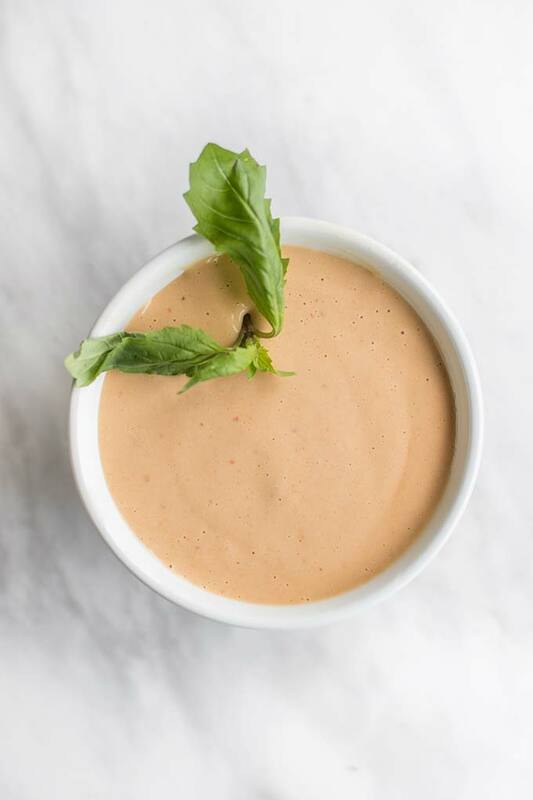 It will pour out of your blender liquid, but as it sits, it lightly solidifies, into a seriously creamy and addictive sauce. It gets tons of flavor from coconut aminos, fresh lime juice, sesame oil, and sriracha chili sauce. A light and summery Thai inspired appetizer or light dinner. 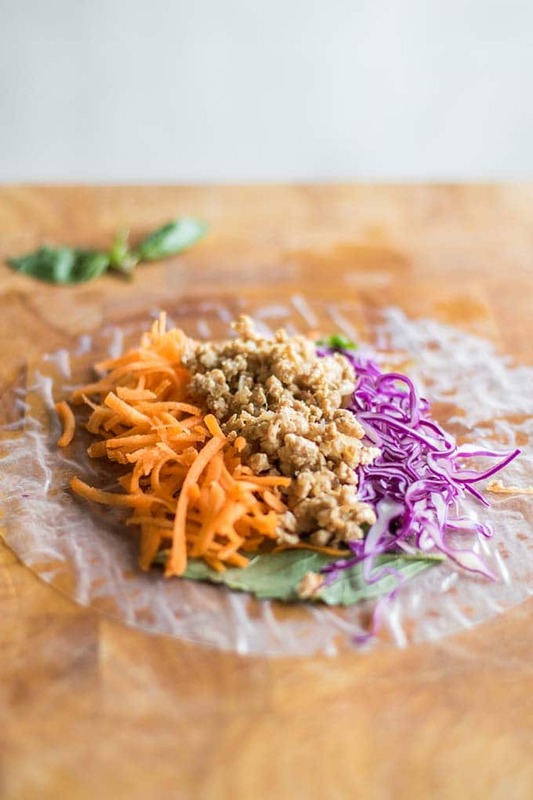 Rice paper wrappers are filled with fresh crunchy vegetables, herbs, and ginger chicken. Serve with a Thai sweet chili sauce -- but I highly recommend trying to almond dipping sauce! Add sesame oil to a frying pan, then saute the minced ginger and shallots on medium for 4-5 minutes, until soft and translucent. Add minced chicken to the frying pan, and stir fry until browned. Season with coconut aminos, sriracha, and sea salt. Set aside to cool. Add all ingredients to a blender. Blend on high speed for about a minute. The coconut milk will whip and the sauce will end up pourable, but light and airy. Once it has been refrigerated, it will solidify a bit, but remain light and airy. Set up a “station,” with a flat, round bowl of warm (not boiling) water, and bowls of all your filling ingredients. Take a rice paper wrapper, wet it in the bowl quickly. Don’t allow the rice paper to sit in the water until it’s soft. It will continue to soften as the fillings as added. Start by adding herbs to the center of the rice paper wrapper. The leaves can be left mostly whole, but tear them a bit to release the flavors. Then, add the cabbage and carrots. Add the ginger chicken to the center of the rolls, so when rolled, the chicken isn't in contact with the rice paper. Try not to overfill. The papers will be difficult to roll if too many fillings are added. Start rolling by folding the top and the bottom in towards the middle, like wrapping a burrito. Then grab a side, and roll over. The rice paper sticks to itself quite well, so the rolls stay wrapped tight. If the rice paper is tearing, it is too wet. Try to use a kitchen towel to dry your rolling surface between spring rolls, and make sure the water isn’t too hot, and the paper isn’t left in the water too long. Serve with “No-Peanut” Sauce, or a spicy rice wine vinegar. Often Thais use a sweet chili sauce or a sweet and sour tamarind sauce. Nutrition facts are for 1 roll plus 1/16 of the dipping sauce. 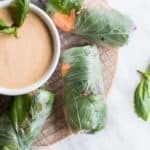 This Thai Spring Roll post contains affiliate links, meaning if you make a purchase, I receive a small portion of the sale. This helps me keep Sunkissed Kitchen running! These look so amazing and fresh! Spring rolls have always been the one "healthy" thing my picky son would eat. I love the almond butter switch. I wish I could get my picky son to eat these! He hate everything as a baby -- and as an almost 3 year old, he eats fruit and carrot sticks but pretty much says "yucky" to anything else healthy. I hope he grows out of this!